Spicy. Tangy. Creamy. 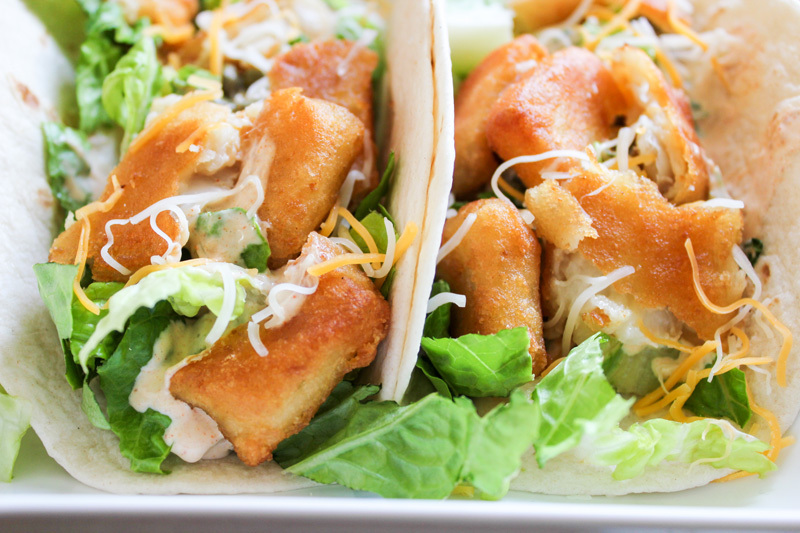 Crispy, flaky fish filled tacos. These fantastic Fish Tacos with Baja Cream Sauce are absolutely perfect for a quick weeknight dinner or anytime you feel like some yummy tacos! If you’re a mom (and really even if you’re not) weeknights tend to be so busy. Activities, homework, LIFE – there’s just so much to do and there isn’t a lot of time to stand in the kitchen for hours on end. I love preparing made from scratch recipes for my family, but every once in awhile, when I’m short on time I need to come up with an easier version. 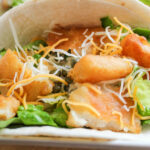 Let’s introduce these awesome Fish Tacos with a Baja Cream Sauce, spicy, savory goodness. Now, if you have lots of time on your hands, feel free to beer batter your fish on your own. I do sometimes… but usually only on weekends. But if you are looking for a super easy, delicious weeknight dinner that takes less than 30 minutes to put together with a few short cuts… this really is it. It’s delicious, easy and filling. Plus… tacos! 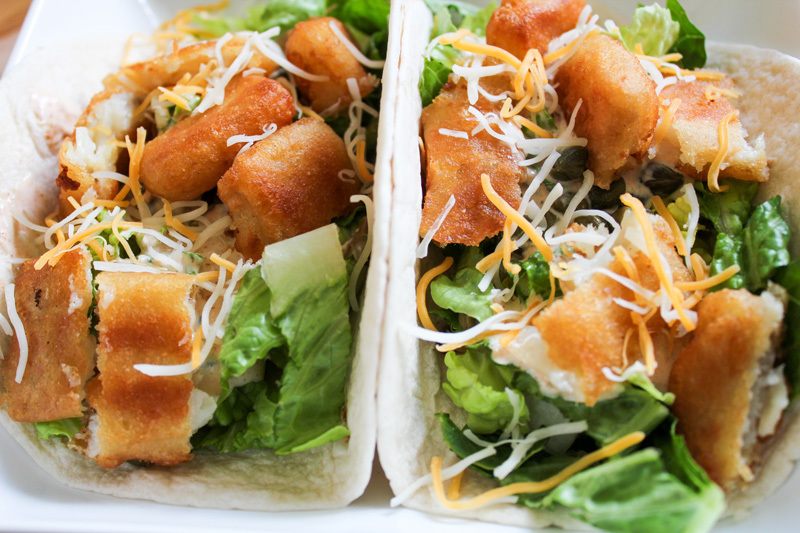 For Fish Tacos:Prepare 1-2 fish tenders per person (per taco) as directed on the back of the package. (this took 20 minutes for us) When finished, slice the fish up anyway you'd like to put it in the taco. Lay a soft tortilla on a plate. Place shredded lettuce on the tortilla. Then layer the capers, avocado and tomatoes. Top with the cooked fish tenders. And then drizzle the Baja sauce over all of it. Be sure and check out the other fabulous easy recipes posted so far this month. Sole Bonne Femme by What Smells So Good? Want some more delicious tacos? Try these Butternut Squash Portobello Tacos with Garlic Sage Cream Sauce. They are to die for! Just the other night I had fish tacos at a restaurant. The sauce they served them with was not so good. It made me want to make some at home and have something better. Now I see your sauce and wow! Love it! Great flavors and I can’t wait to try it. They do need a good sauce though, and I’m sorry you didn’t get a good one at that restaurant. I adored this sauce and was thinking of so many other ways to use it. Delish! Thanks Renee! These look so good! 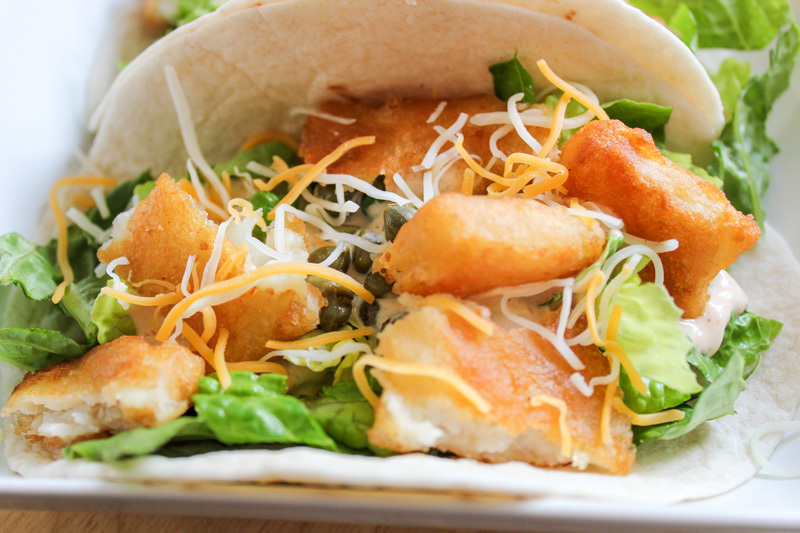 Is it wrong to want fish tacos for breakfast? The sauce sounds yummy to and I love that you incorporate yogurt. It’s my fav way to cut fat! No, no it’s certainly not. Because if it is, I’m in trouble. Everytime I look back at these things, I think…. I want. Now. This is such a fantastic dinner idea! I love fish tacos. Yum! Thanks Bea! 🙂 Me too! I had fish tacos in Hawaii that were amazing and ever since I got back, I’ve been dreaming about them. This is such an ingenius and quick way to make them – using frozen fish! I’m always hesitant at buying fresh fish because I either buy bad cuts or I mangle them during the cooking process. This way, I’ll be guaranteed delicious fish. Thanks for sharing, Nicole! I love fish tacos, and the sauce is what makes it for me! Yours looks delicious! Pinned! Can’t wait to try it!